Personalize your private bath with the versatile design of this modern shower panel. 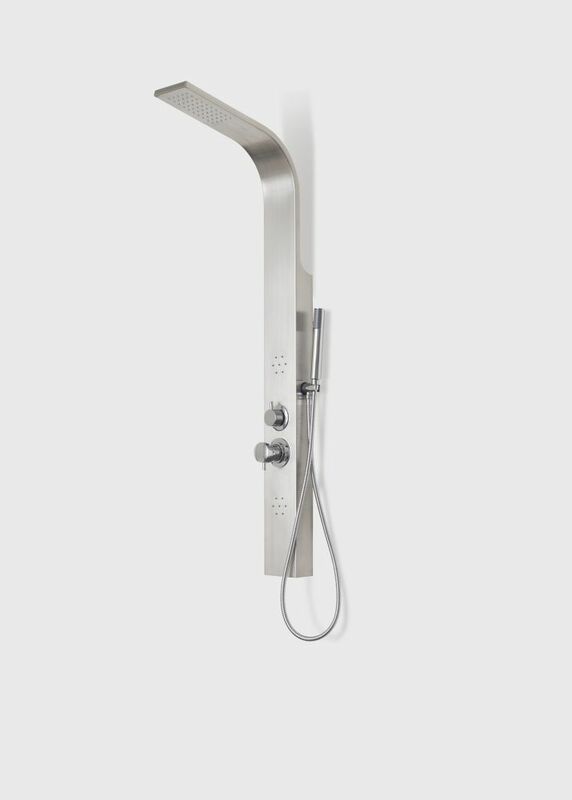 Featuring a rain showerhead, handheld shower and two immersive body jets along the center panel, this contemporary bath fixture offers multiple options to surround yourself with spray. The slender profile lies perfectly flush when installed against a flat wall, while a streamlined silhouette and stainless steel construction maximizes your bathroom's space and style. Two sleek circular knobs control temperature, pressure and direction to create a completely comprehensive shower system that's an essential addition to the modern master bath. Capri II Shower Panel Personalize your private bath with the versatile design of this modern shower panel. Featuring a rain showerhead, handheld shower and two immersive body jets along the center panel, this contemporary bath fixture offers multiple options to surround yourself with spray. The slender profile lies perfectly flush when installed against a flat wall, while a streamlined silhouette and stainless steel construction maximizes your bathroom's space and style. Two sleek circular knobs control temperature, pressure and direction to create a completely comprehensive shower system that's an essential addition to the modern master bath.